At Montefiore Einstein Center for Transplantation, exceptional outcomes, technical innovation and clinical excellence define our program. Staffed by world-renowned surgeons and physicians who partner with pioneers in basic science at Albert Einstein College of Medicine, we are elevating the standard of care for transplant patients while advancing knowledge about the diseases that cause organ failure. Our techniques are state of the art, and our approach is multidisciplinary, enabling us to offer sophisticated treatments and access to clinical trials that patients might not receive elsewhere. Complex cases are referred to Montefiore because we are one of the longest-running transplant programs in the region and have the expertise and technology to give our patients the very best 21st -century medicine has to offer. 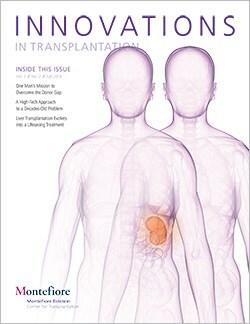 From preoperative evaluation, to advanced intraoperative techniques, to comprehensive psychosocial support for patients and families, the Center for Transplantation stands at the vanguard of transplant care. In our newest issue of Innovations in Transplantation, we invite you to read about Montefiore’s latest advances in patient care and research. 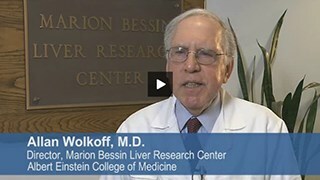 The team at the Montefiore Einstein Center for Transplantation, led by Drs. Paul Gaglio, Sarah Bellemare and Milan Kinkhabwala, were able to remove Mr. Fearn's diseased liver and replace it with 60% of his sister's liver, a procedure called live donor transplantation. Patients requiring new livers currently face months or years on an organ donor list, but promising research indicates that stem cell biology may one day offer alternatives to transplantation.